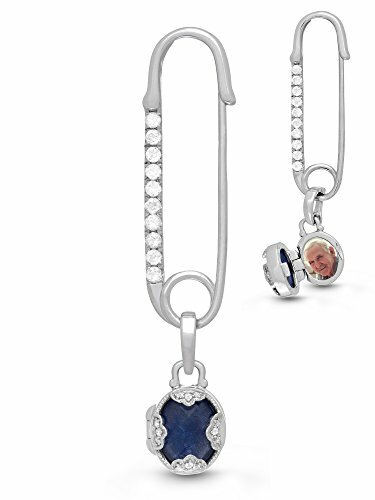 The Gloria custom photo locket bouquet pin by With You Lockets pays tribute to those you love with striking blue lapis suspended on a white topaz studded safety pin. A sweet and elegant finishing touch, this timeless pin is destined to be a treasured addition to any collection. A nod to the opulent age of art deco, this custom photo locket pin can be secured to a wedding bouquet for brides or bridesmaids to carry a loved one with you down the aisle. An unforgettable gift for women and girls. A finishing touch to bridal and special occasion looks. A custom photo locket unlike any other. We put your picture in it! This unique custom photo locket pin is the perfect gift. Use your favorite picture to personalize your jewelry for any occasion. We started with photos of antique lockets as our inspiration and recreated them in a way that felt both modern and vintage. The result is a collection of lockets that capture all the fine details and workmanship of a family heirloom in contemporary shapes and sizes. With You Lockets is a line of necklaces, pendants, bracelets, anklets, rings, bangles, brooches, bouquet pins, dog tags, heart lockets and glass lockets all with a place to insert a special photo. Our keepsake lockets are comprised of 925 sterling silver, 14k yellow gold and 14k rose gold that hold photos. Produced with love and great care they are the perfect gift for celebrations, brides, bridesmaids, weddings, milestones, celebrations of life, memorials, bereavement, births, graduations, Mother's Day, valentine's day and Christmas, or even to hold a memory like a wrinkle in time. Like the memory they honor, they are something to be cherished.